With over 20 years’ experience in the long- term care and association markets we realized people need something better. That’s why we developed LTCRplus. We are very pleased to inform you that your membership provides you exclusive access to LTCRplus - the most innovative Group Long Term Care Benefit program in the market. The financial protection options under this program are the best available and allow you to find the HIGHEST benefits for the LOWEST premiums with exclusive group discounts not available to the general public. You can even compare the newest coverage options that pay benefits even if you don’t need care. The “plus” in LTCRplus is that the benefit program goes beyond financial protection. We know what happens when families face the complex emotional and financial challenges of long-term care and have added key benefit services. The LTCRplus Group program is designed to ease the emotional burden and save you time and money. We designed this benefit for our families – let us help yours! 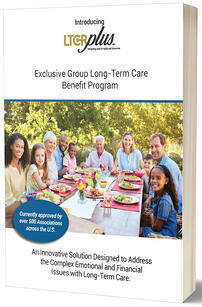 Request your LTCRplus Group Long Term Care Benefit Guide today!